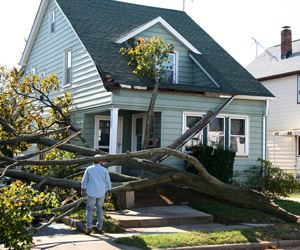 Has your home been damaged by summer storms? This time of year, many homeowners become victims of home repair scams. Con artists often show up at a homeowner's door after a disaster, offering an array of services and demanding a hefty down payment up front. They might offer a "great deal," based on using materials left over from a neighbor’s job – but a "great deal" isn't always what it seems. Frequently these fly-by-night operators drive vehicles with out-of-state license plates or set up temporary offices from which they can move quickly once authorities start looking for them. Get the name and address of the company that the person allegedly represents. Get all details of the offer in writing and carefully review it. Be sure you understand everything in the contract. Any verbal promises made are included in the contract. Determine how long the company has been in business and call organizations with which the contractor is affiliated, such as NARI of Madison or other trade associations, to determine the firm's legitimacy. Remember that any legitimate company that wants your business will be more than willing to allow you the time to do your homework. Don't fall prey to high pressure tactics such as "this is the only chance you have" or "by tomorrow the extra materials will be gone." Gives a post office box without a street address or phone number. Says they just finished work on your neighbor's house and have just enough materials to do repair work on yours. They might say they can give you a better bargain if you let them do the work today since they have the supplies now. NARI is a great source for homeowners seeking to hire a professional remodeling contractor. NARI members are full-time, dedicated remodelers who follow a strict code of ethics, observing high standards of honesty, integrity and responsibility. For more information, visit the NARI Madison website to find a qualified professional who is a member of NARI or to learn more about the remodeling process.